As I’ve been working on the Soldier Card Project, I am continually reminded of the need for remembrance and commemoration of our military veterans and heritage. I recently picked up Ted Barris’ book, The Great Escape: a Canadian Story and thoroughly enjoyed it. Packed with fascinating details about prisoner of war life, Barris dispels the myths of the 1963 Hollywood movie by the same name. The Great Escape from Stalag Luft III is a great Canadian story – something which Hollywood and its storytelling machine frequently overlooks (remember Ben Affleck’s movie Argo?). Reading the book, I was constantly moved by the ingenuity, resourcefulness and courage of the Canadian airmen incarcerated at the Sagan prisoner camp and their role in planning, supporting and executing the attempted mass prison escape of 24 March 1944. The terrible retribution for the escape and the forced march of prisoners by their Gestapo captors ahead of the Soviet advance across Eastern Europe is retold through the eyes and stories of Canadian POWs by Barris in moving detail. I highly recommend this book to anyone interested in Canada’s military history and heritage. We are fortunate to have author, Ted Barris, join us to discuss his book in Kitchener. 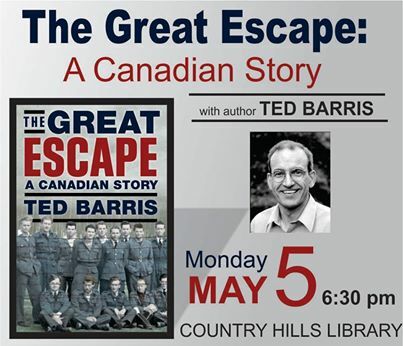 I hope that you will join me on Monday May 5, 2014 at 6:30pm at the Country Hills Branch to welcome Ted and to hear about his research and the untold Canadian story of the Great Escape. It’s a free event, but registration is required. Register online or call the Country Hills branch or InfoLink. What do they say? Something about best laid plans… As with any large move, there are always changes. In the interests of organizing the shelving and move into the new GSR room, the movers and the move coordinators made the decision to box the reading room collection late this week. 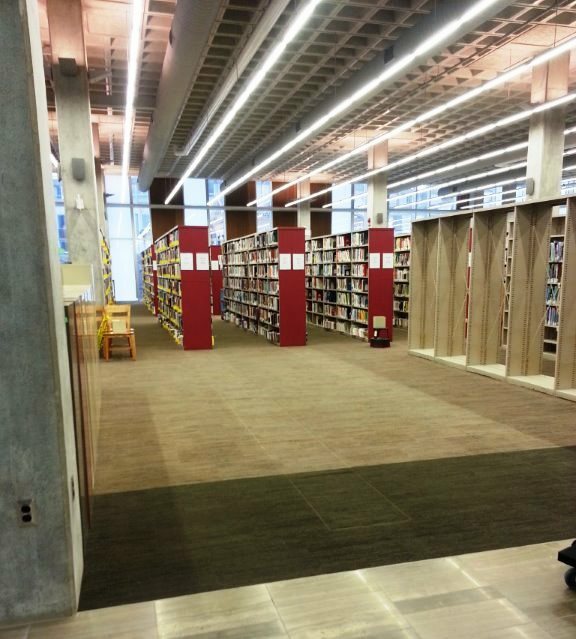 As you can see, the shelving was also removed. The end result is that I no longer have access to the resources of the GSR, including the microfilms as the readers have been moved to a staging area. If you have queries, please be aware that I may not be able to answer until after we re-open in our final location. I do have a few Vernon’s directories tucked away for Solider Card research queries and have access to our online databases and the vertical files (for the time being). It’s been an exciting time as the new GSR takes shape and the Library begins its transformation. I am sure that everyone will be amazed at the changes. I’ll post more photos as the work progresses. Stay tuned!